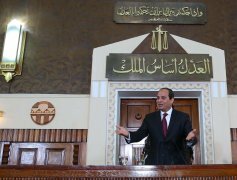 Yet critics say a set of constitutional amendments making its way through Egypt’s Parliament does precisely that. Last week, Parliament voted overwhelmingly to advance the amendments, the primary focus of which have been changes that would allow Sisi to extend his term in office until 2034. But the proposed amendments also include a number of other controversial changes, not least of which are revisions to articles that could further undermine judicial independence and erode the separation of powers by giving the president tighter control over the judiciary.